An indusrial map with a layout somewhat reminiscent of the infamous Coret Facilty. 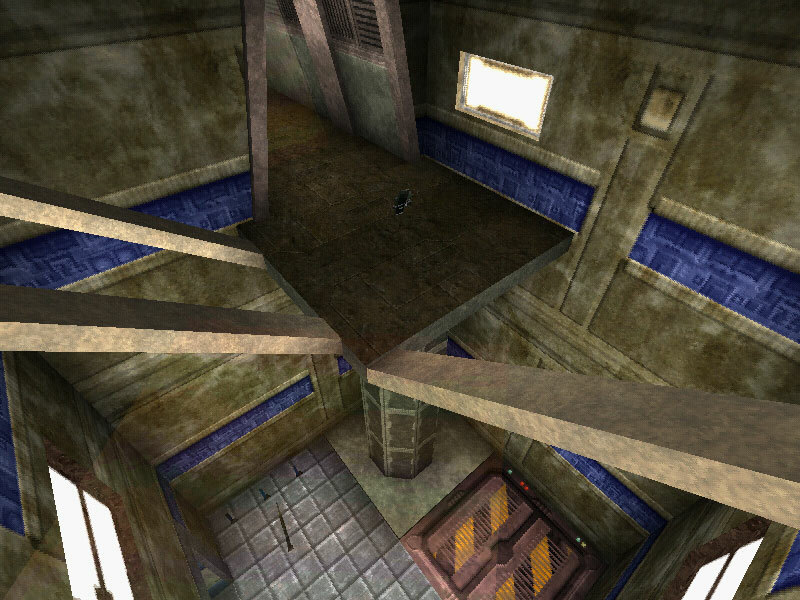 Very much resembling a classic UT99 industrial style, the visuals are a bit bland but the gameplay better. The texture usage is the classic concrete and metal with blue and red stripes that we've all come to know and love from the original UT99. The texturing is well-chosen within its theme and nothing looks badly chosen or badly applied. There are some misalignments but nothing that will grab your eye away from the gameplay. The lighting is fairly good overall. Heavily spotted with white lights, the colored lights are nicely saturated and nothing is neither overbright nor too dim. Some areas appear a little ambient lit but there is some nice shadow work around the place and nice light beams spotted around as well. The architecture is a little too basic, though. 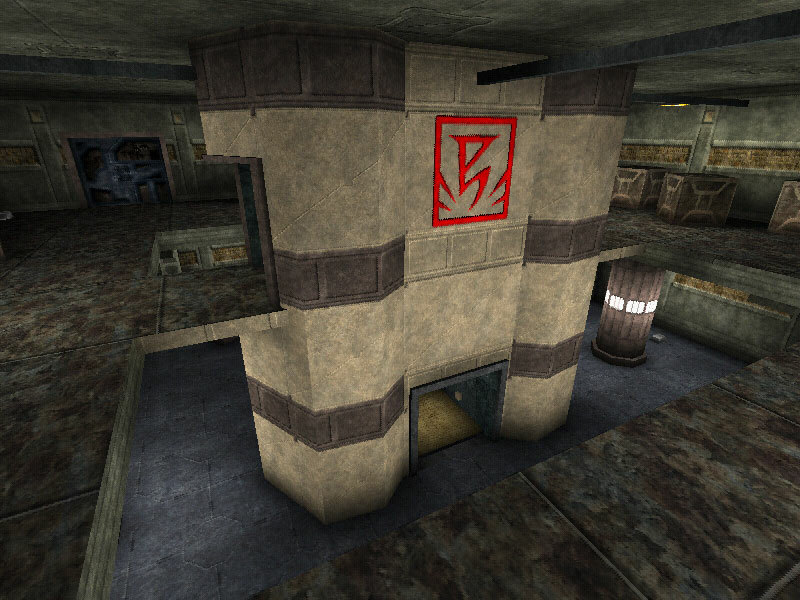 Mostly rectangular, the author attempted to offset the boxiness by using rectangular beams which does help a little but softening rectalinear corridors with rectilinear beams can't help too much. Some corridors are nicely shaped curves with walls that slope inward up to the ceiling which is a refreshing change. 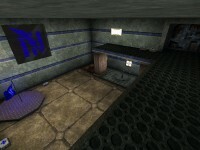 Overall the texturing is nice and the lighting is pretty good but the architectural style leaves a bit to be desired. The end result looks like a whiter, cleaner, coret facility complete with glass floor in one section, but it's still a little bland. The BSP is put together well and appropriately zoned - no offending HOMs or other visual inconsistancies. The author used a mix of lifts and kickers. The kickers do their job but seem to be a bit overpowered. Sorry - very overpowered. The bots use both, fortunately, but I didn't hear any sound associated with either. Also something I didn't hear is any ambient sound whatsoever. Dissappointed! Finally, the author pathed the map appropriately and also included Xloc paths. However, there were no alternate paths that I could find. This doesn't affect the bots too too much as I did notice they tried different paths, but a few went largely unused. In general it's built well, but missing sounds and alternative paths bring it down a fair bit. There's some good gameplay here. There's z-axis in almost every room and good trasitions between the two levels. However, there are only two levels so you'll most likely be fighting on either one or the other most of the time and not from one to the other. This also means there's little to no variable z-axis. As mentioned earlier, the bots tend to stick to the main paths which leaves them a little predictible. Another problem is that the flag room entrances are both in the same place but vertically different. So it's fairly easy to defend seeing as you always know where the other team is going to enter. otherwise, the layout is pretty nice and the doors offer a nice element of surprise. The weapons were layed out fairly well although I think placing the flak cannon in such an enclosed area right above the flag was a little harsh. The shield belt isn't exactly out of the way, but it is placed off to the side. Finally, the damage amp was placed in a pool of water. A nice risk/reward balance, however you're in and out of the water too quickly to be a very good risk and they're the only water pools in the place which is a little out of place. In general there's some good gameplay here between the z-axis, general layout, and weapon placement. On ther other hand the bots are easy to predict and the flak cannon placement is a little suspect. In sum, the layout and texturing may remind you of old school UT99 maps like Coret Facility. The lighting works fairly well but the architecture leaves a little to be desired. There's a distinct lack of ambient sound and the super pickups are placed thoughfully but a little insuffieciently. Still, there's some fun gameplay here and due to the predictibleness of the bots, it would probably be more fun for humans. 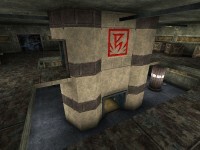 Not a stellar map, it will still be a pretty good time for CTF addicts. For the rest of us, it's not bad, just not that great either. Very good map! The textures don't make my eyes bleed. Good basic layout. The only thing are the bio guns. I think you shouldn't have two near each other. Maybe have a sniper gun or something. Anyway very nice! I didn't quite like it as much but it is effective. Bots are good, and the construction is decent. 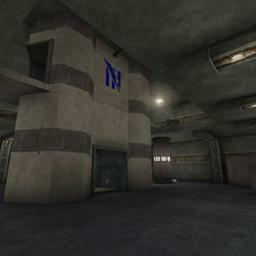 Lighting is ok but this map works well for a CTF map. Everything is good...except that this map is boring. There is no "wow factor". A very avarage map. There is nothing wrong with avarage, though. The map is nice. I had a great fun playing it. Textures are not bad. Bots play well. I agree. Very average with nothing to grab you. Not much in the way of z-axis action either. It's too bad this guy stopped. he had good potential.